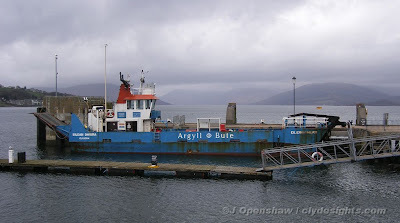 Ferries overhauled at Ardmaleish Boatyard are not limited to those of CalMac - Argyll and Bute Council use the yard for their annual refit of the Jura ferry EILEAN DHIURA too. She arrived at Rothesay on Sunday afternoon, where she was seen lying at the pier on Monday afternoon . EILEAN DHIURA is employed by the Council on the short crossing between Port Askaig on Islay, and Feolin on Jura, and was built by the McTay shipyard at Bromborough on the River Mersey. Originally commissioned by Glasgow-based Stirling Shipping to replace a ferry that they managed, she entered service in 1998 but managed by Serco Denholm. After a number of years, management was transferred to ASP Seascot, another Clyde-based company. Her bow ramp was replaced in 2002 following a series of problems with the original.